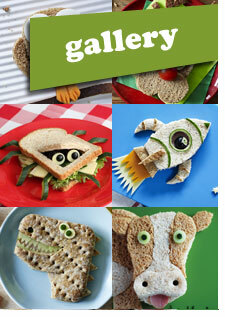 Book up a Funky Lunch Day for your school, or purchase a pack today. 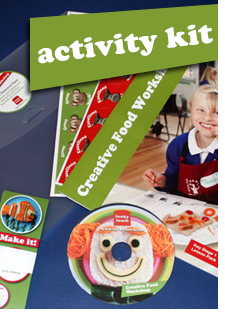 Run your own Creative Food Workshop with our Activity Kit! Order a signed copy of our award winning recipe books today. Need to encourage picky eaters? Our gallery will have just the thing. Funky Lunch founder Mark Northeast was recently asked to work with the lovely Sophie Ellis-Bextor to help promote the new Actimel for Kids yoghurt drinks. Watch the first of our videos as we create some fun and nutritious snacks. At Funky Lunch we don't just make sandwiches, our creative food artist Mark has worked for national and international brands turning ordinary ingredients into extraordinary creations. These have been used for events, social media marketing, promotions and even tv commericals. Check out the amazing gallery on our sister site Creative Food Design. 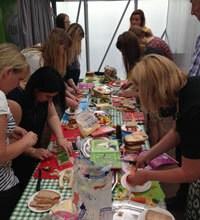 We've had great fun recently running our Creative Food Workshops at Festivals and Events around the country, showing both children and adults how to have fun with food. We are the ideal partner to have at your event, providing a unique range of food workshops that will inspire young minds and bring out their creativity... all with the help of healthy ingredients. Keep up-to-date with all the goings on at Funky Lunch HQ. To visit our blog click here. 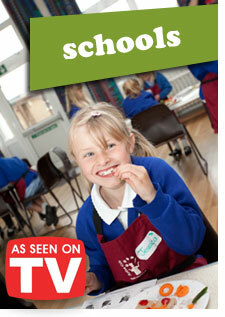 Our brand new enterprise days for secondary schools are proving a big success, click here for details. 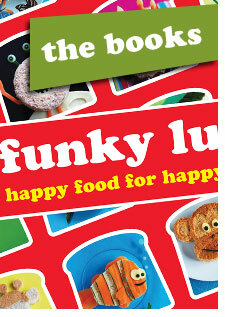 Buy Funky Lunch activity kits, posters and books in our online shop, click here. Our award winning recipe books will have you getting funky in no time, to order your signed copy click here.